A preliminary 4.4-magnitude earthquake Tuesday evening in southern Riverside County was felt throughout San Diego County. The quake struck at 6:24 p.m. in Aguanga, near Temecula, north of the Palomar Observatory and about 11 miles northeast of Pauma Valley, according to the U.S. Geological Survey. 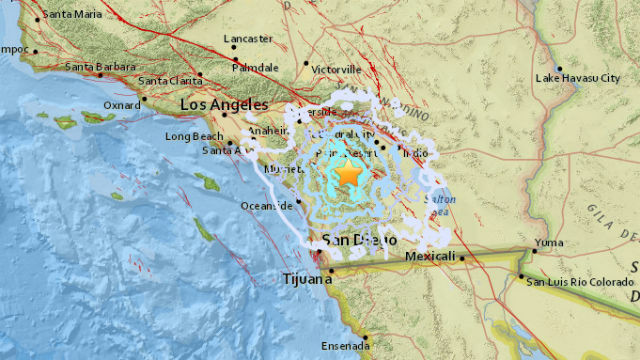 The quake was shallow, about 2,000 feet deep, and was felt as far north as Banning and as far south as Chula Vista, according to USGS Did You Feel It? map. A preliminary 3.0-quake struck in the same vicinity about 30 minutes later, according to the USGS. That quake was not felt as widely as the first. No injuries or damages have been reported so far from either temblor.